Roy Williams is nothing if not candid. For the third press conference after or before his team played Duke this season, Ol’ Roy was honest about not having to face Zion Williamson in all but 34 seconds of the two games, UNC’s first home-and-home sweep of the Blue Devils since 2009. He acknowledged that Zion makes a big difference in Duke’s team and how it plays, but ended each round of questioning by quoting the famous line by Rhett Butler (Clark Gable) to Scarlett O’Hara (Vivien Leigh) in the movie classic Gone With the Wind. “Frankly, my dear…” he said to a few snickers but far more glassy eyes from an ever-young press corps, most of whom had never heard of the 1939 OSCAR winner. Frankly, he doesn’t “give a damn” because he knows that injuries are a part of the game and when they happen you dance with who ya brung. He’s been on the other side of it enough times. 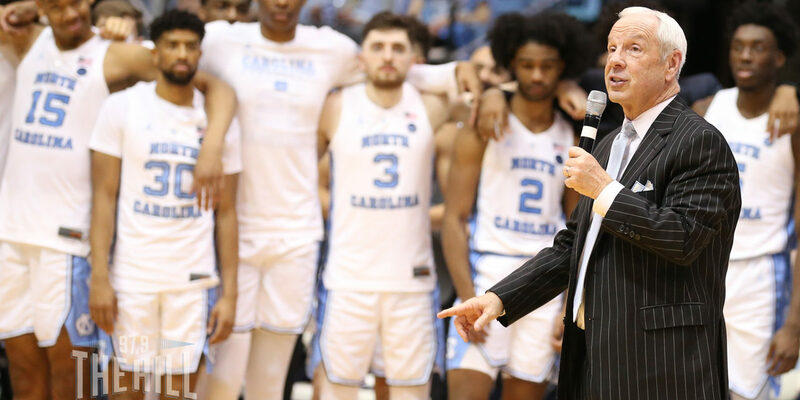 “I thought we had the best team in the country in 2012,” Roy said after the 79-70 win Saturday on the Seniors Night at the Dean Dome, mentioning John Henson and Kendall Marshall getting hurt in that postseason. He might have added losing a 2008 game to Duke at home without Ty Lawson and ticked off a few more tough defeats at Carolina and Kansas when injuries crippled his chances. More than anything, he wanted his current seniors to go out with a win, the fourth consecutive Tar Heel team to be highly ranked with multiple upperclassmen – and, ironically, freshman Coby White fueling the third straight win over Duke. They still did it the hard way, shooting poorly for most of the game and not making a field goal for the last 6:47 while the Blue Devils sliced a 15-point deficit to five. Senior Night can be a two-edged sword, emotional and also full of game pressure not to lose. After White’s scoring burst seemingly sewed up the win with under seven minutes to go, the Tar Heels suddenly found themselves caught between running the clock and getting a good shot for a half-dozen awful possessions that had the once-giddy crowd squirming. But, in the end, it was the win Williams wanted so badly for Cam Johnson, Luke Maye and Kenny Williams. And, frankly, he didn’t give a damn about anything else.